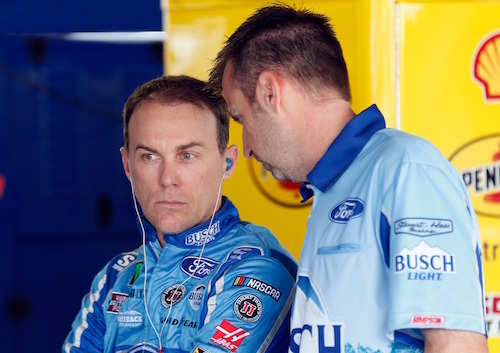 If Kevin Harvick wins the 2018 Monster Energy NASCAR Cup Series championship at Homestead-Miami Speedway, crew chief Rodney Childers and car chief Robert “Cheddar” Smith will be able to join in the post-race celebration, despite their two-race suspensions from NASCAR competition that includes Sunday’s season-finale. Harvick’s No. 4 Stewart-Haas Racing team was penalized as a result of an illegal spoiler used in the race at Texas Motor Speedway on Nov. 4. In additional to the suspensions of Childers and Smith, other penalties included a $75,000 fine for Childers and the loss of 40 points and playoff benefits of the Texas win for Harvick. Harvick regained a position in the Championship Four with a fifth-place finish Nov. 11 at ISM Raceway near Phoenix. Suspensions prohibit individuals from entering areas of racing facilities for which a credential is required for access, such as the garage area, pit road and victory lane. Childers and Smith will be prohibited from entering such areas through most of the Homestead-Miami Speedway race weekend, but NASCAR has ruled that their suspensions will end when the checkered flag waves to end Sunday’s race. As a result, they’ll have access to post-race celebratory events, providing Harvick wins the championship. Other drivers in the running for the 2018 title include Joey Logano, Kyle Busch and Martin Truex Jr. The highest race finisher among the four championship contenders will be the 2018 NASCAR Cup Series champion.